I know you’ve heard it as much as I have: “I could be vegan, but I like cheese too much.” Or, “Cheese was the hardest thing to give up when I went vegan!” Fortunately for us cheese addicts (and yes, I was one and still am to some extent!) there are finally some viable vegan cheese substitutes out there. Daiya has all the bases covered when you want something that melts and gives you an authentic cheese flavor and texture. But what about when you want nacho cheese? Creamy, spicy, chunky nacho cheese that’s everything amazing you remember about decidedly not-vegan salsa-con-queso? Two words: Nacho Mom’s. I’d heard a lot about this vegan queso and had to wonder why people were buying jars of it when it’s so easy to make your own nacho cheese sauce at home. Now that I’ve tried it, I’m wondering exactly the opposite! And you know what I stickler I am for homemade. But guys, take it from me, one taste of Nacho Mom’s and you won’t want to go back. They were nice enough to send me a sampling of their queso line to try, and the first one I dove into was the Fire Roasted variety. Nacho Mom’s doesn’t skimp on anything. This is a thick, flavorful queso that you could feed to any self-proclaimed cheese lover and have them raving. 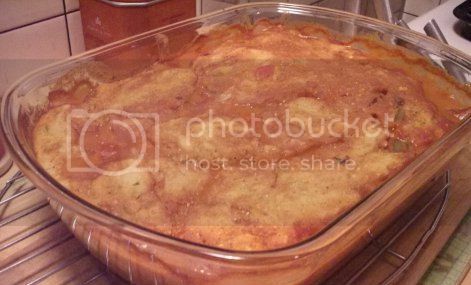 The texture is more like a dip than a sauce, and you could probably even get away with using it as spread if you wanted to. And “fire roasted” somehow doesn’t do justice to this particular variety. It has a spicy, smokey flavor almost like regular smoked cheese, and the color is rich and deep. 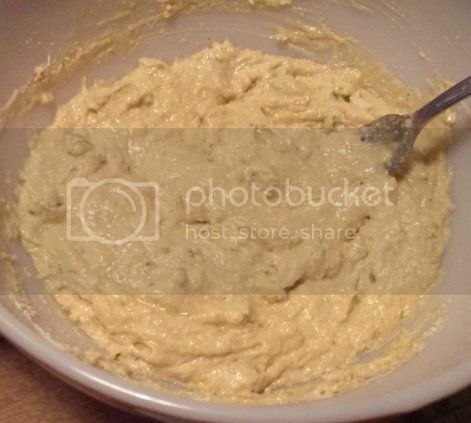 You’d be hard-pressed to have any left if you served this stuff as a dip at a party. Since I don’t eat much dip or go to many parties, I started playing around with ideas for recipes that could use this queso as an ingredient. Two chili-centric recipes immediately sprang to mind: pizza with a cornbread crust and southwestern flair, and a casserole incorporating chili and cornbread (one of my personal favorite combinations). I’ve included both here. 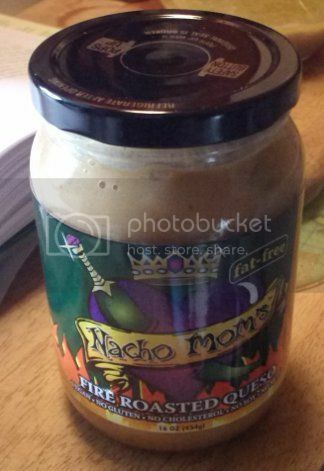 I suppose you could make them with any nacho cheese sauce, but I urge you to give the fire roasted Nacho Mom’s a try. It’s a completely unique flavor that I think you’ll fall in love with as much as I did. If you’re not sure where to find Nacho Mom’s in your area, check out the “Where to find us” page on their website! You can also follow them on Twitter and read their blog. Addendum: my mom and I tried the Ultimate Vegan Queso on vegan omelets tonight and it was amazing. Just as tasty as the Fire Roasted, but no smokey flavor. I may have to make a full recipe with it this week so I have an excuse to eat more! 1) Preheat the oven to 375°F. Get all of your ingredients ready. 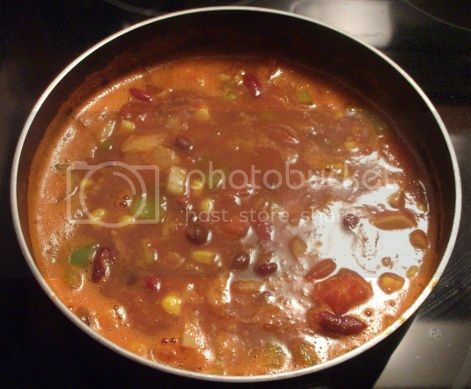 2) Pour the vegan chili into a deep casserole dish. 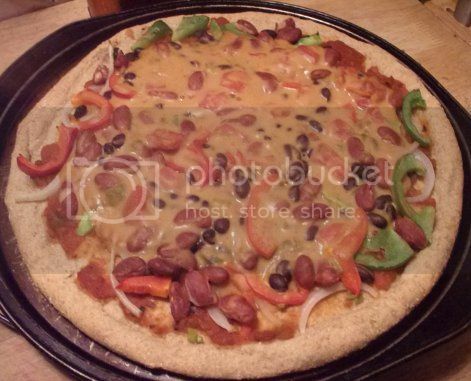 Add the queso and swirl or stir to incorporate. 3) Carefully spoon cornbread batter over the top of everything. Don’t worry if it doesn’t make a neat covering or if it sinks a little; it will come together during the cooking time. 4) Bake uncovered until the cornbread is done, about 30 minutes. A toothpick inserted into the thickest part of the cornbread should come out clean and the chili should be hot and bubbly. 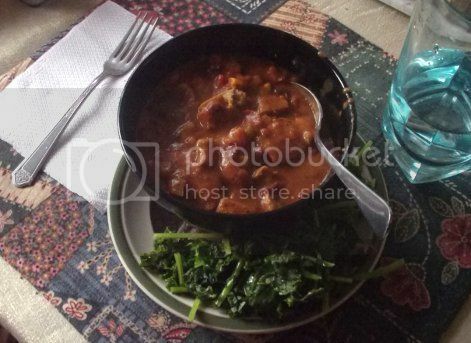 Serve in a bowl with a green veggie on the side. 1) Dissolve the yeast in the hot water and set aside. In a large bowl, mix together the flours and cornmeal. Add the salt and sugar and mix well. 2) Add the yeast mixture to the flour mixture and stir until well combined, adding more water if the dough is too dry and more flour if it’s too wet. Knead for a few minutes until the dough becomes elastic and bounces back when pressed. 3) Cover the bowl with a towel and put in a warm place to rise until doubled in size, about 1 hour. 4) Preheat the oven to 425°F. Spread the dough in a pizza pan and bake for 8 minutes. 5) Remove the dough from the oven. Spread with salsa and top with the onions, peppers, hot chile (if using), and beans. Pour the queso on top and spread it around with a rubber spatula. 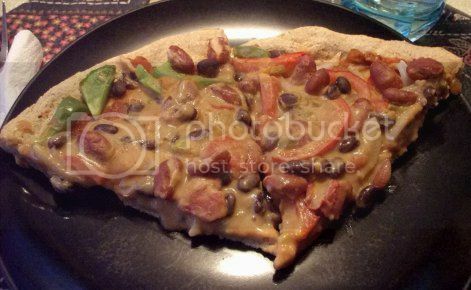 6) Return the pizza to the oven and bake until the crust is lightly browned and the queso is steaming, about 12 minutes. Cut into 6 slices and enjoy! Thanks for visiting my blog during VeganMoFo! I’ve had a lot of fun with all of these posts, and it’s made me want to blog more often. Things will inevitably slow down a bit around here in November, though, as I leap from Vegan MoFo straight into NaNoWriMo. But I hope you’ll visit again, because I’ve got some more cool stuff planned, including another giveaway and hopefully some fun posts as the holidays approach. Happy MoFo, everyone!